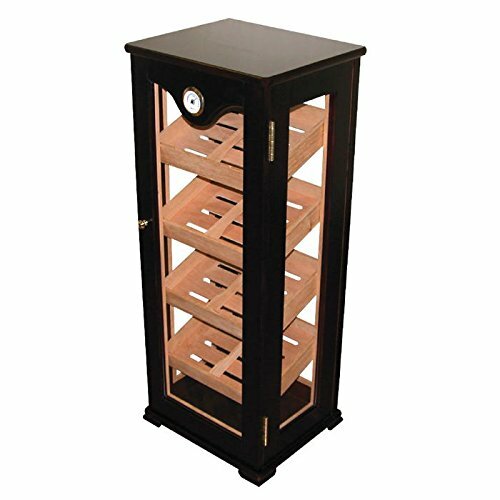 Deluxe vertical cigar display humidor, can hold up to 100 cigars. Its space-saving vertical design with four tempered glass sides makes for an impressive display with maximum efficiency. This large humidor display includes 4 reversible shelves that are set at a 45 degree angle for front or rear accessibility, each shelf has Spanish cedar trays with dividers, lined with premium kiln dried Spanish cedar. The humidor display includes a large rectangle humidifier and 1 glass hygrometer with brass frame. Also features gold-plated lock, key with tassel and rich, dark mahogany finish. If you have any questions about this product by Retail Display 7, contact us by completing and submitting the form below. If you are looking for a specif part number, please include it with your message.